I devote a lot of time and space on this blog writing about ‘B’ Movies, those frequently overlooked quickies from days past made on the cheap for the bottom of a double feature bill. Some are highly innovative, others less so, but they served as a kind of on-the-job-training ‘film school’ before there was such a thing. Most (but not all) of them have something to offer, whether a performance by a cast member on their way up (or down) or an early effort by a future director of note. 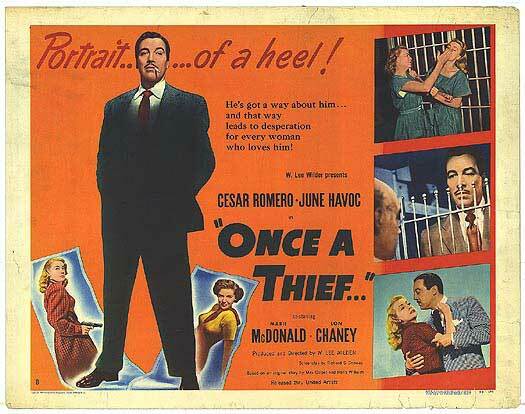 Recently, I watched ONCE A THIEF, and while it certainly broke no new ground, I found it a tight little ‘B’ noir featuring in this case a female protagonist trapped in that familiar downward spiral. This entry was posted in Film, Film Review and tagged Cesar Romero, Cracked Rear Viewer, film noir, Gary Loggins, Iris Adrian, June Havoc, Lon Chaney Jr., Marie McDonald, Once A Thief, Through the Shattered Lens, United Artists, W Lee Wilder. Bookmark the permalink.